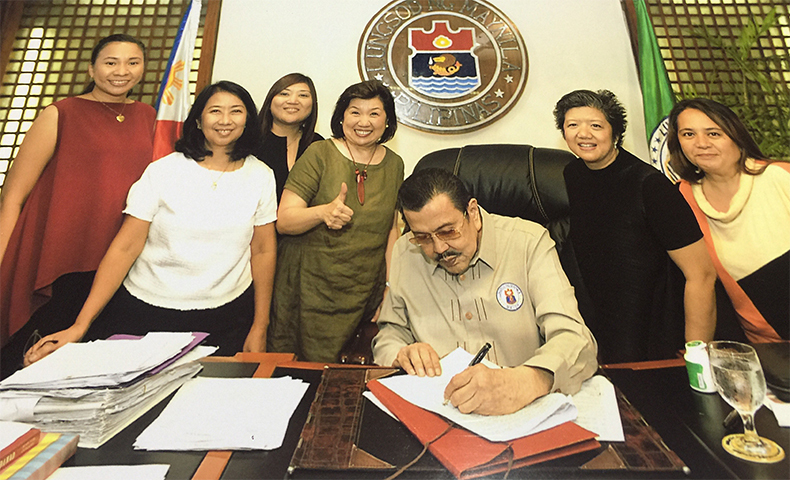 June 13, Manila -- Mayor of Manila City Joseph “Erap” Estrada, ABS-CBN Lingkod Kapamilya Foundation’s Managing Director Susan Afan, and ALKFI’s Chief Finance Officer Noemi Samson, signed the Extinguishment Contract for the Paco Market Management. The management of the Paco Market was part of the initiative of Kapit Bisig para sa Ilog Pasig to rehabilitate the Estero de Paco, a tributary of the Pasig River. Mayor Joseph "Erap" Ejercito Estrada signs the Extinguishment Contract for the Paco Market Management. Behind him are (L-R) Jen Santos, Bantay Kalikasan's Program Director, Noemi Samson, ALKFI Chief Finance & Services Officer, Atty. Candice Bandong, ALKFI Legal Counsel, Susan Afan, ALKFI Managing Director, Maja Olivarez-Co, and Christy Fulgencio, Paco Market's Market Supervisor. In 2010, the restoration of the 100 year old market was started. Since then, the transformation took form through the physical structure and in raising environmental awareness in the vendors and shoppers of the market. A partner in the restoration of the Paco Market was Maja Olivares-Co of Sonia Santiago Olivares & Associates Inc.
After years of managing the market, ALKFI officially turned it over to the city of Manila effective July 1, 2017. The ABS-CBN Lingkod Kapamilya Foundation, Inc. is grateful to all its donors, partners, to the people of Manila and the Paco Market Vendors Association for all the rehabilitation and advocacy work implemented in the Paco Market and the nearby esteros. It will continue to advocate for the people and for the environment.